absolutely fail at photographing the beauty of this polish. 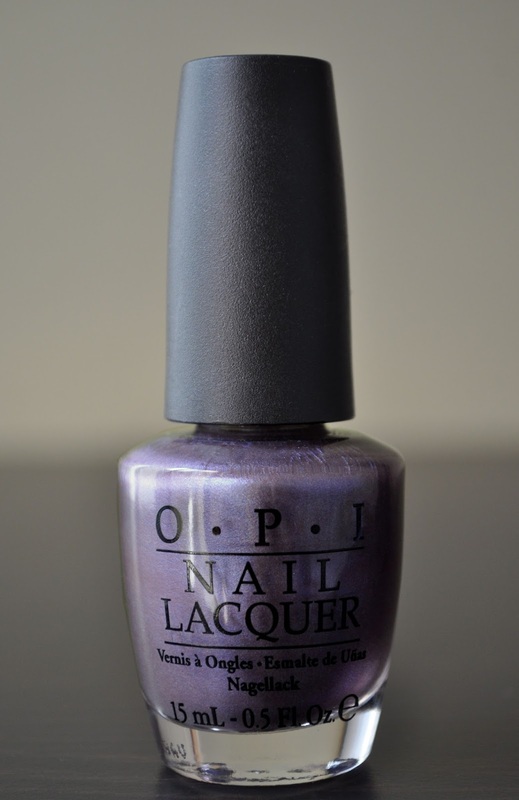 Originally from the O.P.I Fall 2010 Swiss Collection, I've always felt The Color To Watch was better suited for spring. Continuing to fail at capturing the color, I used four coats in the photo above. A stunningly, unique color, The Color To Watch is a grayish-taupe based, murky lavender duochrome, with flashes of blue and a pinked-lilac, loaded with microscopic lilac pink, blue and silver shimmer. The Color To Watch has a very sheer formula, but I believe this polish's translucency is part of its appeal. With a single coat, it can be used as a topper, metamorphosing whatever polish it's layered over. A second coat gives the nails a delicate, ethereal iridescence; whereas, I found the third coat enhances the blue in the polish, and showcases the shade in its full opaque glory...can you tell I really like this color?! Also, The Color To Watch has a fairly good wear time of three-to-four days. Not bad, since I find thinner formulas tend to chip a whole lot faster on me. If you're attracted to this color, I'm sure you can find it on ebay or amazon. HAH! It took me five seconds to buy a bottle on Amazon. You done good! Yay! Mission complete >:) How did the color work out for you? I hope you enjoy it Poppy. I'm mostly a reader, not usually a commenter, and I don't know where else to post to check on you. It's been a while since you've posted and I just wanted to say I hope you are ok.
You are welcome. I am relieved you're okay. Again, thank you Susan :D I'm not sure if I've asked this, but do you have a blog? :) I'm intrigued by the thought about blogging, but I've never committed to it. I enjoy reading them. Maybe someday, if I could ever decide on what my focus should be. I like so many things that blogging on a specific subject seems almost impossible. I love how you have a focus on beauty but also introduce tidbits about other things that interest you. Most especially the tasty-related posts. I love seeing foods and snacks that I'm not exposed to where I live. The thing is just to get started, you'll find the voice for your blog after. If you ever start a blog, please let me know, I would love you follow and support you. I've been thinking of adding more tidbits to the blog like movies/anime, music,etc. What other things would you like to see?